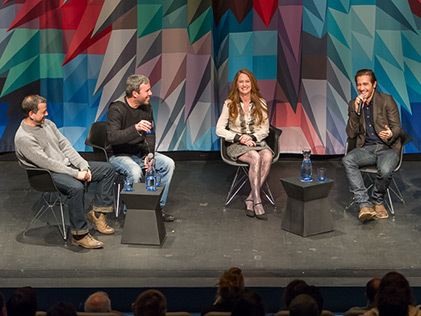 Actors Jake Gyllenhaal and Melissa Leo, screenwriter Aaron Guzikowski, and director Denis Villeneuve (Incendies), spoke at Museum of the Moving Image after a special screening of their riveting thriller Prisoners. Gyllenhaal plays Detective Loki, who is investigating the disappearance of two young girls. He arrests a potential suspect, Alex Jones (Paul Dano), but a lack of evidence forces his release. Leo plays Alex's mysterious mother, Holly Jones. As Scott Foundas wrote in Variety, Prisoners sustains an almost unbearable tension for two-and-a-half hours of screen time, satisfying as both a high-end genre exercise and a searing adult drama of the sort Hollywood almost never makes anymore."